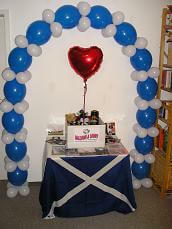 A balloon arch is ideal for a wedding arch decoration. But before we delve into the "how to" instructions, let's cover some basics first. How long should the decoration last? Is the decoration for an indoor or outdoor event? How many helpers do you have for building the arch? How much time and money do you want to you invest? A helium filled arch, especially a so-called "String of Pearls", is the easiest and less time consuming solution. As the balloons float, you won't need any sturdy construction. The balloons are simply attached to a fishing line. This also works for an arch made of balloon clusters of three to five balloons each. A simple variation of a single line arch is the so-called "Link-O-Loon" (or Linkaloon) arch. Link-o-loons have special ends to tie the balloons to each other. All you have to do is inflate the link-o-loons with helium and knot them together with these ends. You can get a huge variety of Link-O-Loon balloons at bargain prices at Amazon. If you attach clusters of four 5" balloons in contrasting colors between each link-o-loon, you get the beautiful result as shown on the picture. The downside of every helium filled decoration is their relative short life span of about 12 to 24 hours and the cost of the helium. In summary, helium filled arches are best for indoor events that last a single day or evening. Wedding balloon arches would be a good example for the use of helium filled designs. a sturdy base at either end to anchor the arch. You also need to consider how to blow up the balloons. As you will need about 6 balloons per inch, it would take a lot of breath to blow them up by mouth. A hand pump could be an alternative, but it still is hard work. The easiest solution would be an electrical balloon inflator. If you don't want to buy one, you could try to find one for renting. Air filled arches take some time and effort to prepare. However, you can do this well in advance, and you can re-use both the frame and the bases. Now let's take a closer look how to make these beautiful decorations, whether helium or air filled. This elegant "String of Pearls Arch" is ideal for framing the head table at a wedding or to highlight the entrance to your party. Have you ever wondered how Spiral Arches get their nice pattern? See our example to find out. Walking through this majestic Star Shaped Arch might really feel like entering heaven. That's why it's called "Celestial Arch". It is one of our featured balloon decorating kits, and comes complete with metal frame, pearl white balloons and instructions. Interested in Wedding Balloon Decorations? Which Balloon Decorating Kits are right for you?